BDU: The Office of the Vice President for Research and Community Services has launched Integrated Watershed Management Community Service Center at Debremewi Village of Yilmana Densa District. Community Services Director of the University Taye Demise said that the opening of the center will help villagers to receive capacity building training in areas of land use and management, and livelihood enhancement schemes. 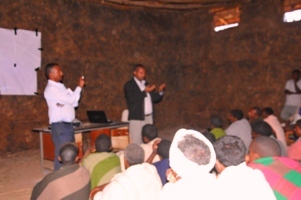 According to the statement of the Office, the villagers of Debremewi will participate in experience sharing programs which are hoped will aid them to improve their productivity in agriculture.During the inaugural session at Debremawi, representatives from Bahir Dar University and villagers were present. BDU:The Office of the Vice President for Research and Community Services has recently organized a training whose objective was to improve skill and knowledge of Women Writers. During the function, the University’s President Dr.Baylie Damtie, The Vice President for Information and Strategic Communication Molla Ababu and The Vice President for Research and Community Services Dr.Tesfaye Shiferaw addressed trainees. 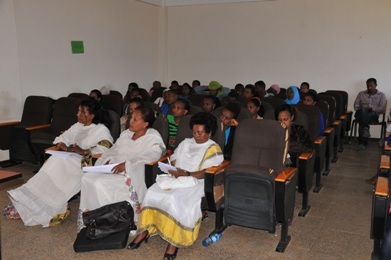 The training was organized by the Ethiopian Women Writers’ Association Amhara Chapter in collaboration with the Vice President Office for Research and Community Services, Bahir Dar University. TechnoServe Ethiopia has facilitated a three day practical oriented training (March 17-19, 2014) here in Bahir Dar to 62 bakers from Bahir Dar, Gondar and Mekelle. The training has focused on the products of bread, biscuit and cookies. Knowledge about ingredient types, composition, functionality, quality control and new product development has been obtained in addition to key steps in bread and biscuit processing associated with detailed discussion about process and ingredient related problems, troubleshooting and process control parameters. The trainers were highly experienced scientists and volunteers from Partners for Food Solutions (PFS) and General Mills of USA. Bahir Dar University has played its part in the training by two instructors from Food Technology and Process Engineering Program in order to assist the experienced trainers in making sure that no knowledge and skill flow from the trainers and experience sharing and questions from trainee sides were hampered due to language barriers. The food process laboratory of Bahir Dar University was used for hands on sessions. A similar training was held a week before (March 10-12) at Harmony Hotel of Addis for bakers from Addis Ababa and nearby cities and towns to benefit 68 trainees. The trainees have expressed their appreciation to all who participated in organizing such an important and problem solving training stating that they acquired a lot of knowledge that surely change the way they do business in order to profit more from baking. It is remembered that TechnoServe Ethiopia has made an agreement with Bahir Dar University to conduct five trainings each to be conducted in Addis Ababa and Bahir Dar (Hawassa). The first two trainings, “Mycotoxin Prevention and Control” and “Food Safety Management system” have been carried out in Bahir Dar and Addis by Bahir Dar University experts. The rest three trainings namely, Milling Science and Technology Bakery Science and Technology and Flour Fortification (to be conducted in June 2014) were planned to be conducted by highly experienced professionals from USA. The Bahir Dar university staffs have, in addition to filling the gap of language barrier between the trainee and trainer, benefitted from the knowledge transfer themselves and became more practical and able to sustain the knowledge and skill through teaching their students and training the community engaged in milling and baking businesses. TechnoServe Ethiopia has facilitated a three day practical oriented training (March 17-19, 2014) here in Bahir Dar to 62 bakers from Bahir Dar, Gondar and Mekelle. The training has focused on the products of bread, biscuit and cookies. Knowledge about ingredient types, composition, functionality, quality control and new product development has been obtained in addition to key steps in bread and biscuit processing associated with detailed discussion about process and ingredient related problems, troubleshooting and process control parameters. The trainers were highly experienced scientists and volunteers from Partners for Food Solutions (PFS) and General Mills of USA. Bahir Dar University has played its part in the training by two instructors from Food Technology and Process Engineering Program in order to assist the experienced trainers in making sure that no knowledge and skill flow from the trainers and experience sharing and questions from trainee sides were hampered due to language barriers. The food process laboratory of Bahir Dar University was used for hands on sessions. A similar training was held a week before (March 10-12) at Harmony Hotel of Addis for bakers from Addis Ababa and nearby cities and towns to benefit 68 trainees. The trainees have expressed their appreciation to all who participated in organizing such an important and problem solving training stating that they acquired a lot of knowledge that surely change the way they do business in order to profit more from baking. were planned to be conducted by highly experienced professionals from USA. The Bahir Dar university staffs have, in addition to filling the gap of language barrier between the trainee and trainer, benefitted from the knowledge transfer themselves and became more practical and able to sustain the knowledge and skill through teaching their students and training the community engaged in milling and baking businesses. The office of Vice president for Research and Community Services has disclosed video reports showing the major activities of research and community services carried out in 2006 & 2007 E.C. academic year.